Congrats to those named to the Girls JH Team for 2018 Season. Varstiy will meet in the Locker Room @marx 6:45pm - 9pm WEAR Gold. In preview to this game, both teams are really looking for a win. Early in this season, both teams only have one game. 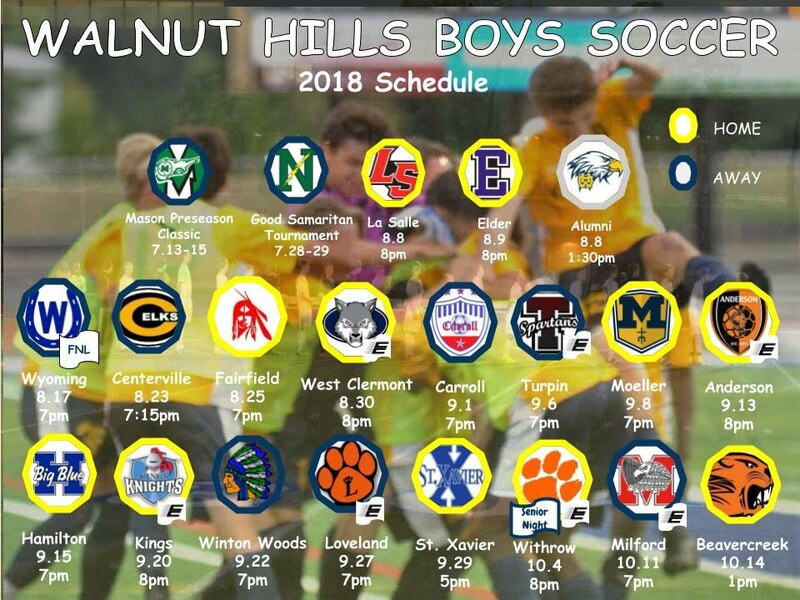 Walnut Hills(WHills), started with a tie against Wyoming that went down to the wire, but ultimately ended 0-0. Little Miami(LMiami), on the other hand started a little more disappointingly with a 3-1 loss to Milford. So, as said before, both teams really need to wipe away their first game and get a win here. WHills start with a 4-1-4-1 formation, while LMiami start with a 4-2-3-1. Early in the first half, WHills gets a free kick about 5 yards out of the 18 yard box, which ends up just as high. As the game continues WHills looks like the dominating force, but LMiami seem to hold their own. Off of a LMiami goal kick, WHills is able to send a dangerous cross in but is stopped by the keeper. This allows LMiami to have a quick breakaway, which seems to be all they can get at his point. This attempt is then, stopped by WHills centreback. As the game goes WHills still continues to get more and more shots off, but none fall in their favor. As the game reaches its quarter mark, the game seems to even out. LMiami gets more shots off, but WHills is still aggressive as ever upfront, putting LMiami on their heels. With the half closing, WHills reasserts its dominance and LMiami now has to defend more than they were before. The half finally closes with the scoreline 0-0, but the game looks far from. At the beginning of the second half, WHills starts off as they ended the previous half, but LMiami has plenty of early chances inside the 18. These are all ultimately shot wide or saved by the keeper. Around 10 min into the half, WHills gets another free kick about 28 yards out. They decide to take no time and immediately lay it off for a shot. The shot is low, so is blocked by the crowd in the middle of the 18. The half reaches its midpoint and the game now seems to be anybody’s. As WHills is getting their shots off, LMiami is going just as hard. After this, the game goes back to being almost one-sided, in WHills favor. This, though, did not take LMiami out of the game. They took the chances they got, but this all proved worthless and the game ended 0-0. Congratulations to those girls who made the jr. high team. Coach Smith will be in touch soon. Congratulations to the players who made the fall team this year. We had a lot of tough decisions and we want to say thank you to everyone who did tryout. As I have told the kids today, there are kids on the varsity who were cut previously and worked their way on to the team. All players are welcome to join us for the off-season in December. For those players who made the program, start next week and Coach Kendall will be taking over coaching till Aug 12, when I return from vacation. Below is the roster for the fall.